Guests stand at the front desk at the Embassy Suites by Hilton hotel in Seattle’s Pioneer Square neighborhood in Seattle earlier this month. Automatic elite status in hotel loyalty programs is an increasingly common feature on credit cards associated with these programs. Now, some cards, such as the Starwood Preferred Guest Luxury Card and Hilton Honors American Express Aspire card, which both carry annual fees of $450, even give cardholders access to the upper echelons of elite status. That’s because automatic elite status in hotel loyalty programs is an increasingly common feature on credit cards associated with these programs. Now, some cards — such as the Starwood Preferred Guest Luxury Card and Hilton Honors American Express Aspire card, which both carry annual fees of $450 — even give cardholders access to the upper echelons of elite status. “The status does make a difference” for consumers, says John Grund, managing director at Accenture Payments, a firm that provides consulting services for banks and payment providers. “(It has) high aspirational value and could certainly be a deciding factor” on whether to get a card. Joe Hegedus of Orlando, Florida, isn’t particularly loyal to any one hotel brand — but his co-branded hotel cards still help him get room upgrades . 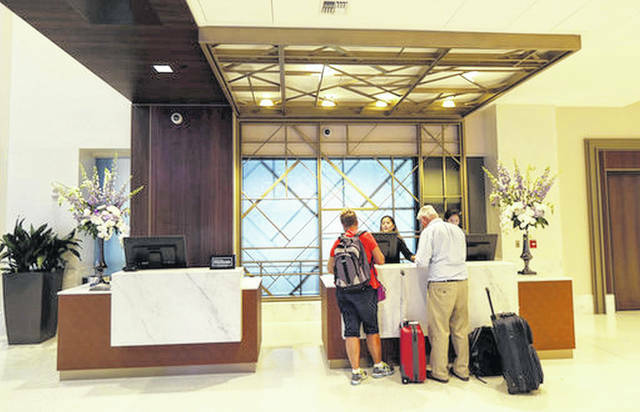 Once, while spending one night at a hotel in Fort Pierce, Florida, with his wife, Sharon, he says he was upgraded to a three-room suite for no extra charge after checking in. “What I would call the laddering of benefits (on hotel cards) has become more sophisticated, more refined and certainly tied in with an expanded portfolio of credit card offerings,” says Grund of Accenture Payments, noting that several hotel brands have recently updated offers or debuted new cards. Nowadays, you can find hotel cards with annual fees of $0, $95 or $450, and benefits that run the gamut from free anniversary nights each year to airport lounge access.